Clinical trials for multiple sclerosis (MS) help to determine if new medications or therapies are safe and effective for patients. Choosing to enroll in a MS clinical study helps ensure that others with this medical condition will continue to receive the best medical care. Experimental therapies or drugs must pass three phases of clinical trials before they can be approved to treat people with MS. If you have been diagnosed with MS, you can take a more active role in your health care by getting involved in clinical studies. Here we provide a running list of active MS clinical trials from around the country. Learn which studies are happening near you and what you’ll need to know prior to enrolling. Multiple sclerosis (MS) is a debilitating, chronic disease that affects the patient’s central nervous system (CNS). MS symptoms can range from mild numbness in the extremities to paralysis or vision loss. Unfortunately, this crippling disease remains difficult to predict with severity fluctuating from case to case. There is a silver lining as the latest treatments and breakthroughs in research have provided renewed hope for people diagnosed with MS.
MS occurs following an immune system attack against the CNS. There is some disagreement over its classification as an autoimmune disease because the specific target in the attack has not been identified. 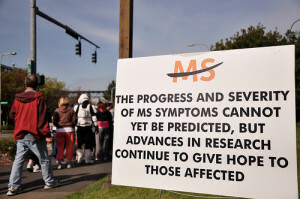 MS is currently referred to as an immune-mediated disease. Following the immune attack, myelin (a fatty substance that protects the CNS nerve fibers) is damaged. This produces scar tissue (sclerosis) which is where the disease gets is name. The damage to the myelin and nerve fibers distorts or interrupts the impulses traveling along the CNS. This causes the wide range of symptoms associated with MS. The drugs used for MS work to alter, or subdue, the patient’s immune system activity. Prevailing MS therapies have been developed on the theory that this disease is the product of an irregular immune response that damages the myelin and nearby CNS nerve fibers. Currently, there is no cure for multiple sclerosis, but effective treatment can limit the severity of attacks and prevent future brain lesions. Medication can also be used to slow down disease progression, limiting the patient’s level of disability in the future. Central Texas Neurology Consultants, P.A.